43 Inverness Street is pleased to present a solo exhibition by South Korean artist Jungho Oak. 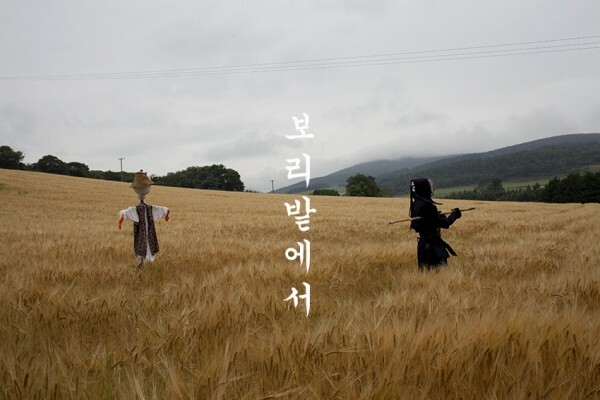 Jungho Oak will be presenting photographs and one single channel video. The works contain a profound elegance usually unexpected from the humorous content. 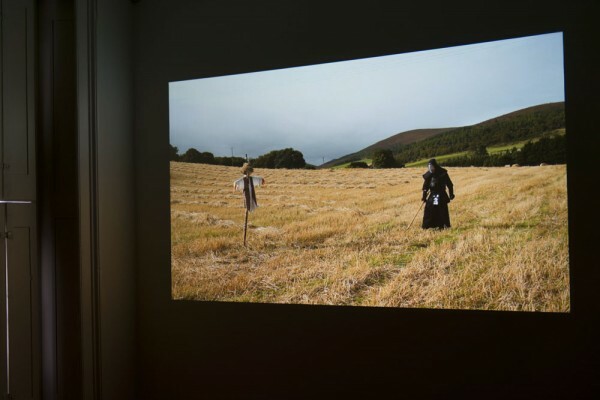 Oak’s video In the Barley Field, 2013, is a subverted confrontation that makes use of the aggressive accoutrements and posturing in traditional Kendo swordsmanship. 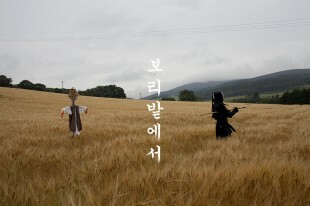 A protagonist in full battle armour pits himself against a scarecrow. Repeated thrusts and swings are met by nothing but a blank immobile straw man. The only shift takes place in the beauty presented by the grand scale of the sky overhead. The attacking slashes of the swordsman is subordinated by the meditative mutability of the weather. It is a comical rendition of futility in a culture of aggression. 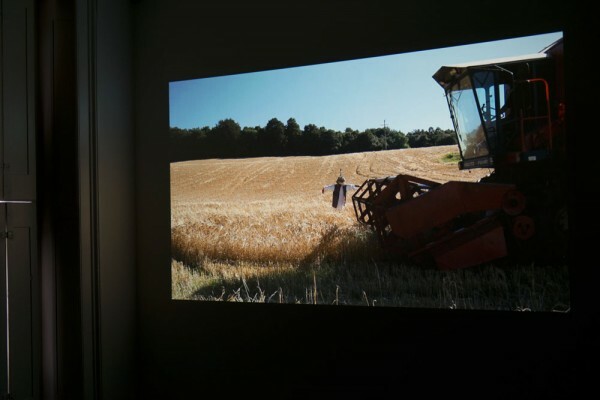 The work was originally shot in Scotland during the artist’s recent stay in the U.K.
Also on display are a series of photographs portraying various yoga poses. In Supported Headstand Pose- Salamba Shirshasana, 2011, and Standing Bow Pulling Pose- Dandayamana Dhanurasana, 2011, while wearing a smartly tailored suit, Oak performs slow movements in a muddy field with a shopping trolley. The combination of the unlikely location with inappropriate clothing and useless props contribute to a feeling of frustration and pathos in his work. The Holy Landscape series consist of photographs of urban public spaces, including a baseball stadium, a horse race track, a shipping harbour, and a distant view of a city built on top of a natural landscape. The large format photograph The Holy Landscape-Hadandong, Sahagu, Busan, 2013, shows a panorama of this unplanned and overdeveloped city. Busan was once populated by refugees from the Northern part of Korea during the Korean war. Hinting a human-constructed folly, the image presents a crowded urban complex, whose hazy beauty is matched by its impressive sprawling scale. This work, as with others from the series, consists of vertical frames made through an editing process of trimming and synthesizing consecutive shots. The eight vertical sections reveal the multiple layers and hierarchical structures within these urban sites and landscapes. Jungho Oak lives and works in Seoul, Korea. His solo exhibitions include The Holy Landscape at Art Space Pool in Seoul, Korea (2011), and Free Plastic at Gallery 175 in Seoul, Korea (2006). He has been included in group exhibitions at Leeum, Samsung Museum of Art in Seoul, Korea (2012); the National Museum of Contemporary Art in Seoul, Korea (2009); Museo Nacional de Bellas Artes Buenos Aires in Buenos Aires, Argentina (2008) ; BizArt in Shanghai, China (2008); Museo de Arte Contemporaneo in Santiago, Chile (2007); and The Walsh Gallery in Chicago. He most recently took part in the Glenfiddich Artist in Residency Program in Duff Town, UK.